You want to get some thoughts out on the internet in a convenient and slick way while also following the gibberish of others? Instead of signing up at a closed and/or regulated microblogging platform, getting your status updates out with twtxt is as easy as putting them in a publicly accessible text file. The URL pointing to this file is your identity, your account. twtxt then tracks these text files, like a feedreader, and builds your unique timeline out of them, depending on which files you track. The format is simple, human readable, and integrates well with UNIX command line utilities. 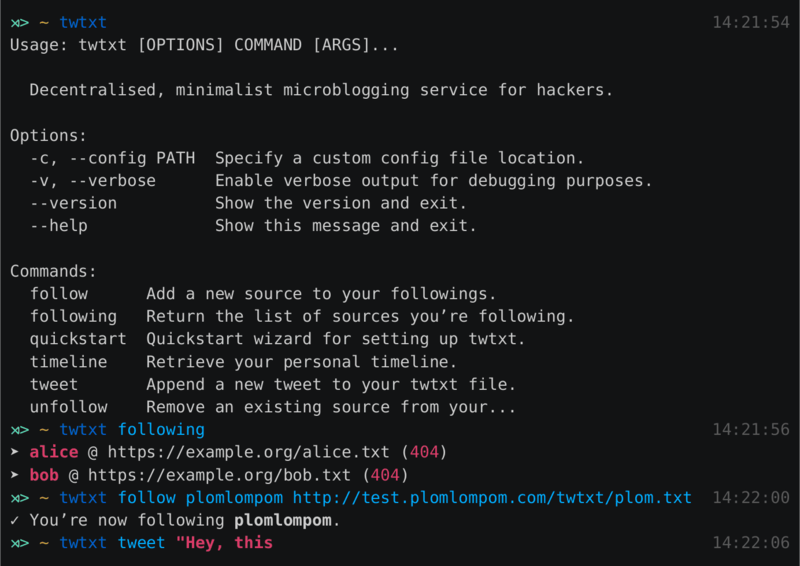 tl;dr: twtxt is a CLI tool, as well as a format specification for self-hosted flat file based microblogging. A beautiful command-line interface thanks to click. Asynchronous HTTP requests thanks to asyncio/aiohttp and Python 3. Integrates well with existing tools (scp, cut, echo, date, etc.) and your shell. Don’t like the official client? Tweet using echo -e "`date -Im`\tHello world!" >> twtxt.txt!